In the first year or so after Lexi taught me to solder, when I still didn’t do it very often, I had a few little catch phrases or mantras that I’d use to remind myself of tips and techniques on how to solder. The main one Lexi taught me was “solder flows toward heat.” It helped me remember where to aim my torch, especially when working on a large piece, as well as where to place my solder in relation to a seam before I began. Lexi also reminded me of her five rules or steps of soldering: Fit. Clean. Flux. Solder Placement. Heat. I admit that I don’t clean my metal (and especially not my solder wire) well enough, so this is one mantra I need to keep repeating! Now, though the soldering technique is pretty much second nature to me, I still find myself repeating some of those little mantras when I work, especially when I have difficulty trying to solder a join or approaching how to set it up. Here are nine soldering tips and mantras I’ve gathered through the years that help me remember proper solder protocol. 1. You want solder to flow up a seam, not just melt. 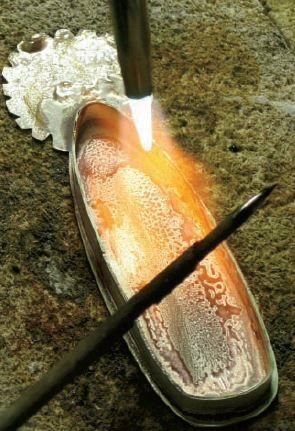 Remember that the flame from the torch doesn’t “melt” the solder–the flame heats the metal, and that heat causes the solder to flow where you want it. Don’t approach a solder seam with the intent of just melting your solder or you’ll likely do it wrong. 2. Solder will not fill gaps. Ends must meet perfectly for solder to flow up the seam. If you do manage to get enough solder to flow and fill a gap, it will be a weak join and you’ll probably get another chance to try it again later. 3. Flux takes out the guess work. 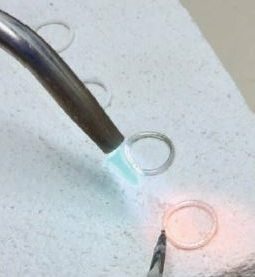 Watch for the flux to turn clear and glassy under your flame; that’s when you know you’re at about 1,100°F degrees and your solder will soon flow. You’ll see a bright silver line appear when the solder flows–stop then, you’re done! 4. Put the solder under the seam. I know Lexi doesn’t like third hands, so as her loyal student, I wasn’t interested in them either. 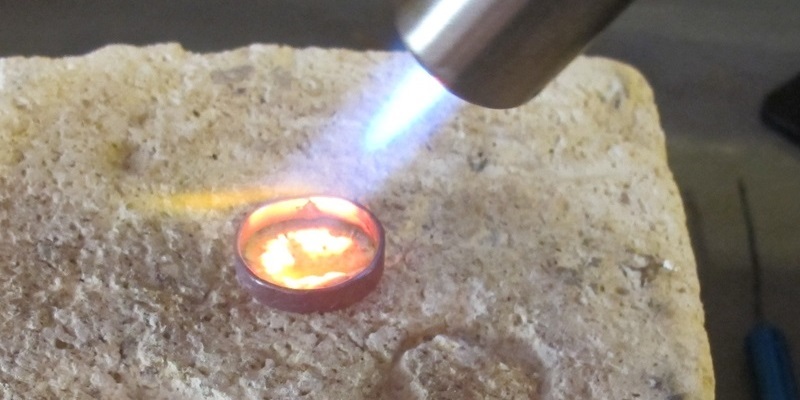 I simply place solder under the seams that I’m soldering and heat the metal; the weight of the piece keeps the solder from blowing off from the force of the flame and the solder flows right up the seam. However . . . see number 5. 5. Soldered joins need support. There are some instances when a little bit of rigging with binding wire or T-pins is necessary to hold a piece together tightly during soldering. Another options is to carve out a holding spot in my firebrick to create the set up. But I’ve always managed to do it without a third hand! Nickels also make handy supports and weights to lift up, hold together, or hold down parts during while you solder them. 6. Remove solder gone wrong with tools. If you accidentally solder two chain links together or solder a stray piece of metal where it doesn’t belong, Lexi says to prepare a sharp, clean solder pick and lightly heat the offending seam. Then stick the pick in the seam or between the joins and pull them apart. I’ve had success getting molten solder to “jump” onto a heated pick, too. 7. Solder on an elevated tripod. 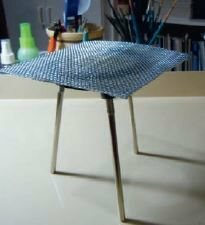 If you do torch enameling on a tripod, you might have discovered this one already. A similar method is also handy for soldering. It allows you to heat sensitive metal pieces and joins from underneath (such as heating back plates of bezels) or if you fear melting a piece or the flame blowing off the solder. 8. Solder wire needs to be clean. Don’t cut more pallions of solder than you’ll use at a time, because it’s much easier to clean when it’s still in wire form than in tiny little squares! I often forget to clean my solder wire because I usually use paste solder. 9. Solder cleanly on a clean surface. When your fire brick gets burnt up, dirty, and crusted in flux, Helen Driggs recommends scrubbing all of that mess off on a concrete sidewalk or driveway to reveal a clean like-new surface. Ttreat yourself to Making Soldered Jewelry, our five-star-rated special issue dedicated to the art of soldering and packed with informative soldering articles by Lexi and other pros, plus several how-to projects that rely on soldering skill for their fabulous designs. 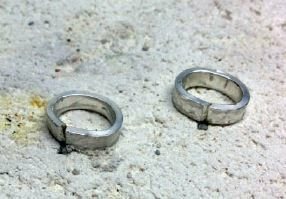 Making Soldered Jewelry is an essential resource on soldering for metal jewelry makers of all skill levels and a must-have to keep on hand near your bench. Hundreds of this special issue sold the first day we released it–get yours now and see what all the buzz is about! Master soldering with these expert resources from the Interweave Store!